Picture Australia, and you likely envision the eucalypts, or gum trees, that dominate many of its landscapes. In fact the gum tree is an icon of the Australian bush. These trees provide food and shelter for many species of native animals, including koalas, possums, and birds. But you’re just as likely to enjoy the shade of a eucalypt in urban or suburban areas, where they’re popular landscape trees. There are nearly 900 species, and most are native to Australia. Only a handful of species occur naturally outside of Australia, on New Guinea, and nearby islands in Indonesia. You don’t have to go to Australia to see eucalypts, though. Various species have become established all over the world, maybe even in your neighborhood. Eucalypts are evergreen, flowering trees and shrubs. 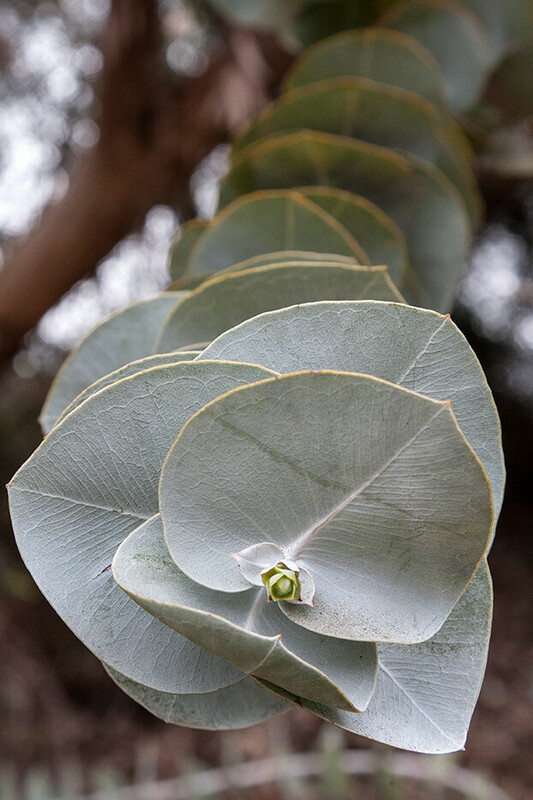 In most—the 10 or so species in the genus Angophora are exceptions—the developing petals are modified into a cap-like structure that covers and protects the developing bud. As a bud starts to bloom, it forces this little cap to fall off. Eucalypt flowers produce nectar that’s food for insects, birds, bats, and the tiny honey possum. 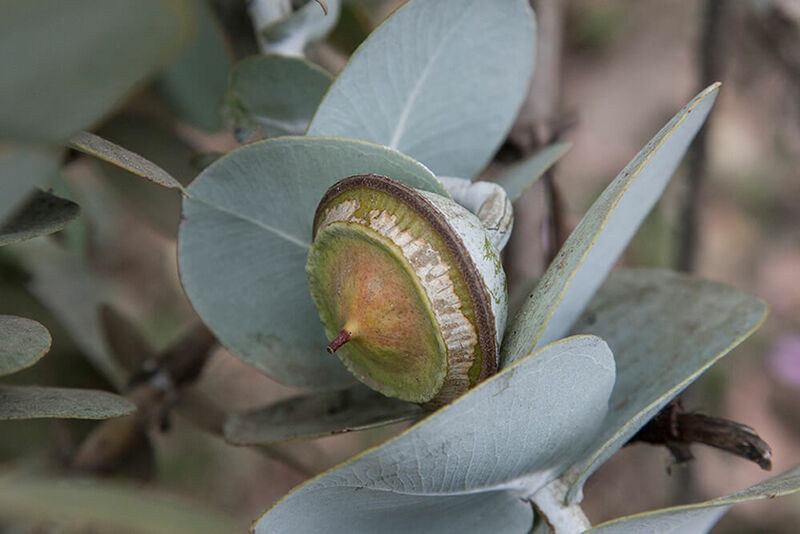 Hard, woody seedpods called gumnuts develop from eucalypt flowers. Eucalypt leaves produce oils that vaporize under normal temperatures and pressures, their scent permeating the air. Australian soldiers returning by ship from World War I and World War II smelled the aroma of eucalypt even before they could see land on the horizon. Toxins in eucalypt leaves include lignins, tannins, terpenes, phenols, and other poisonous substances. Seasonal growth affects levels of these toxic compounds in eucalypt leaves. 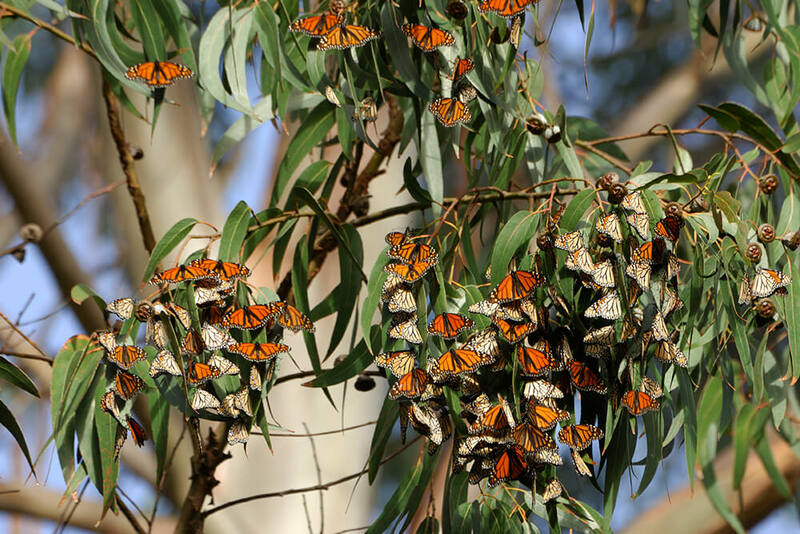 Many animals can’t tolerate eucalypts because of these compounds, but some do. Koalas even specialize on it. At the Zoo, gum trees have an important purpose: to feed the koalas! The furry marsupials eat browse cut from more than 30 species that grow at the Zoo, the Safari Park, and our browse farm. Not every zoo that displays koalas has the right climate to grow gum trees, so we also supply koalas in other states and countries with eucalyptus browse. Aboriginal Australians used gum trees for a variety of purposes: medicines, tools, shields, dishes, canoes, musical instruments, firewood, and timber for building. Today eucalypts are still valued for their timber as well as for their pulp, and as landscaping trees and windbreaks for highways, orange groves, farms, and ranches. 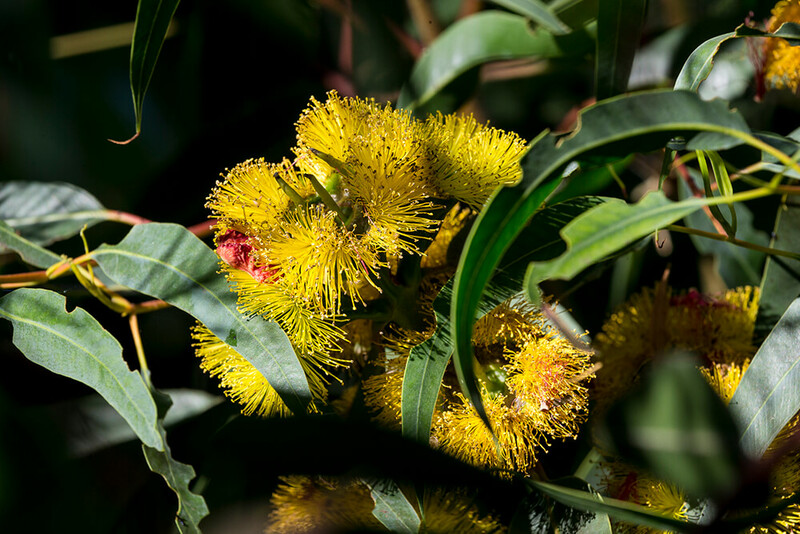 The flowers of many kinds of eucalypts contain nectar valuable in the beekeeping industry. About 10 species are grown for their oils, which have uses in medicines, cleaners, antiseptics, flavorings, fragrances, cosmetics, and insect repellents. The oils and toxins in eucalypt litter make it slow to decompose, so it accumulates under trees. In some species, long strands of bark hang from limbs. All this adds up to fabulous fuel for hot, intense bushfires sparked by lightning. If you’re a eucalypt, that’s not necessarily a bad thing. In some species, seeds stay safe in their seedpods until they’re released by fire and distributed by the accompanying winds. Many eucalypts can survive fires that destroy their more fire-sensitive neighbors, an adaptation that has allowed them to dominate Australia. Nevertheless, many species are in jeopardy. Some are endangered due to fire management regimes developed to protect people. Others suffer due to habitat loss. For the Morrisby's gum Eucalyptus morrisbyi , found only on Tasmania, expanding agriculture has destroyed much of its natural habitat. And with only six surviving individuals, the Mongarlowe mallee E. recurva, native to New South Wales, is critically endangered. On the other hand, eucalypts are cultivated all over the world in tropical and temperate climates, and in some of those places—including California—they have become naturalized. In some non-native areas, eucalypts are considered invasive species. 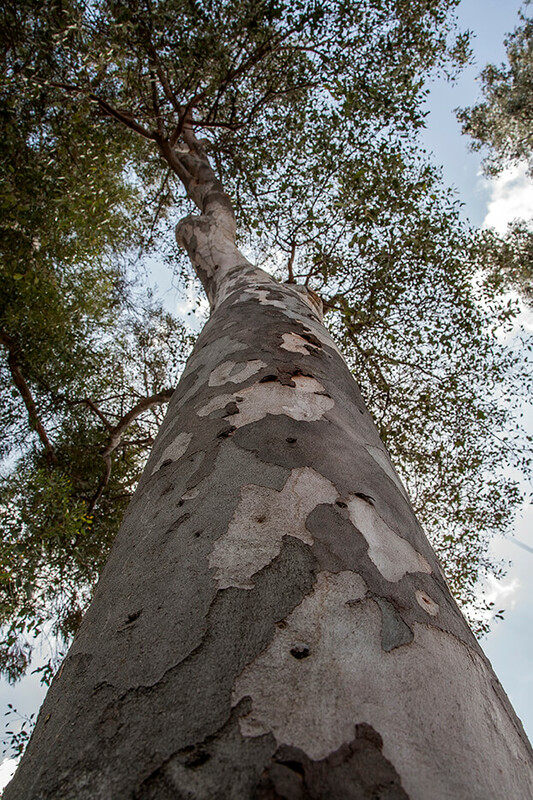 Some eucalypts exude a sticky, gum-like substance—different from tree sap—from the trunk. While not all eucalypts ooze gum, Australians refer to most of them as “gum trees." 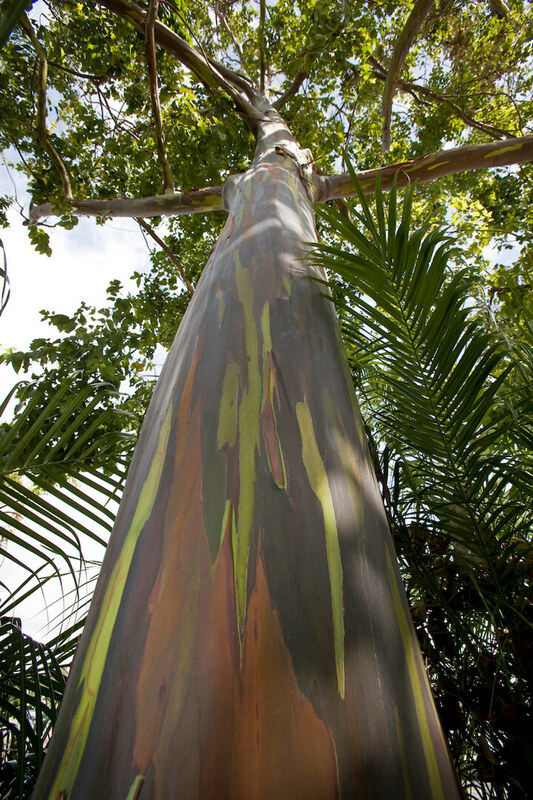 In about half the eucalypt species—referred to as “smooth-barked” trees—the dead outer layer of bark completely sheds, exposing a smooth, new layer of living bark that can be colorful, mottled, or uniform shades of gray, green, russet, or cream. The new bark weathers and fades as the tree grows. In other species—referred to as “rough-barked” trees—the dead outer bark doesn’t shed; it clings to the trunk and branches. Not all eucalypts are in the genus Eucalyptus. This group of trees includes the closely related genera Corymbia and Angophora. Eucalyptus regnans (known by several common names, including Victorian ash, Tasmanian oak, and swamp gum) is the second-tallest tree species in the world, reaching heights of more than 330 feet (100 meters) in Australia. Only the coastal redwood, a conifer, grows taller. That makes this tree the tallest flowering plant in the world. There are nearly 5,000 eucalypts, of 35 different species, in San Diego's Balboa Park, where they account for more than a third of all park trees.